HOLLYWOOD, CA – “Over Troubled Waters” premiered at the world-renowned Artivist Film Festival last night at the Barnsdall Theater in Hollywood. 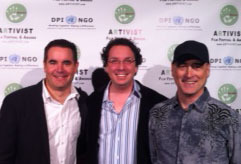 Artivist is the only film festival officially accepted into the United Nations Department of Public Information. Narrated by Ed Begley, Jr., the film was well-received, and the filmmakers’ panel that followed fielded many questions about its subject matter. “Over Troubled Waters” is a hard-hitting exposé of corruption and environmental destruction to one of our nation’s most precious natural jewels, the San Joaquin Delta in California, the largest and richest estuary on the west coast, and how water is being twisted into a commodity for the profit of a few at the expense of all Californians. I was honored to provide the score for this film, which is one of the few places you will find the truth about this subject. Please visit www.restorethedelta.org for more information.